This January saw the marvellous and topsy-turvy world of Wonderland brought to life in three-dimensional glory in the sun-baked grounds of Blacktown Showground on the outskirts of Sydney, Australia. 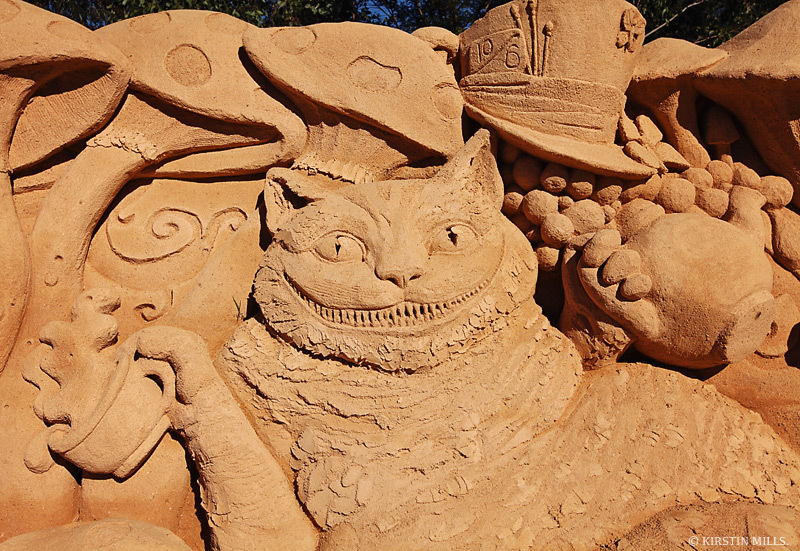 Using more than 250 tonnes of sand, ten Australian and International Sand Sculptors worked for twelve days to create huge sand sculptures depicting characters and scenes from Lewis Carroll’s classic book. Wrought in stunning detail, the sculptures bore a mix of styles, from those faithfully modelled after the original John Tenniel illustrations, to those rendered with a more contemporary twist. The exhibition was accompanied by music that evoked a mood of curious discovery and fantastic, bold adventure. And while the sculptures themselves were definitely the draw-card of the exhibition, the event was complimented with an array of activities for children, including giant chess games, sand-sculpting workshops, and a picnic area to enjoy at the finish (just as Alice, waking from her dream of Wonderland, runs off to enjoy her tea). Wandering about the sculptures was a magical experience indeed, and I was struck by the skill and imagination applied to bringing these beloved scenes and characters to life. The only thing that could have improved the exhibition was if the order of the sculptures had followed that of the book, allowing visitors to follow in Alice’s footsteps and recall the narrative as they moved from scene to scene. With this in mind, I have done a bit of reshuffling to recreate the ‘natural order’ of Lewis Carroll’s narrative with my photos below, each accompanied by the relevant quotes from the tale (though one could argue that the relative lack of logical ‘order’ in the original novel renders any lack of ‘order’ in this exhibition rather appropriate!). I hope you enjoy my photographic tour through this sand-sculpted Wonderland below. Standing right in front of the entrance, this sculpture was the perfect way to begin the exhibition. The design was gorgeous: the white rabbit draws faithfully on Tenniel’s illustrations, while the twisting background evokes the earthy roots among which the rabbit-hole appears. The spiralling pattern of these vines draws our eye towards the hole until, just like Alice, drawn by an inescapable curiosity, we feel on the brink of tumbling in. The spiralling direction evokes a sense of movement, mimicking Alice’s inevitable pull, and her downward (and inwards) fall. If you look through the hole at just the right angle, you can glimpse Alice on the other side. The reverse side of the sculpture is equally symbolic. The chessboard so integral to the world of Through the Looking-Glass – Carroll’s sequel to Alice in Wonderland – intertwines with the roots around the hole, as if the waking and dreaming worlds – above and below – rest against each other like opposite sides of the mirror, and all it takes is a slip through a rabbit hole or a step through the mirror to move from one side to the other. Chasing the rabbit down a long passage, Alice “was close behind it when she turned the corner, but the Rabbit was no longer to be seen: she found herself in a long, low hall, which was lit up by a row of lamps hanging from the roof. There were doors all round the hall, but they were locked…” (Chapter I). One of the most famous scenes in Wonderland, featuring the ‘DRINK ME’ bottle and ‘EAT ME’ cake, you can spot Alice here peeking wistfully through one of the doors into “the loveliest garden you ever saw” beyond (represented by the flowers). Beautifully imagined, the animals swimming through the pool of tears comes to life here, with Alice leading the way. I particularly love the concerned expression on the mouse’s face (having just been frightened with tales of Alice’s cat). Uttering the immortal words, “Who are you?” the hookah-smoking Caterpillar is perhaps one of the most iconic Wonderland characters, and his disdainful attitude and hookah-induced languor is beautifully conveyed here in the heavily lidded eyes and facial expression. Yet another faithful rendition of Tenniel’s illustration, though with the curious omission of the Cheshire-Cat (perhaps he has grown invisible for the moment). The cook holds a pepper-grinder, by which she has saturated both the soup and the air with too much pepper, and soon everyone is sneezing, the baby is crying, and Alice finds that it soon turns into a pig. ‘I wish you wouldn’t keep appearing and vanishing so suddenly: you make one quite giddy!’ [said Alice]. The Cheshire-Cat was one of my favourite sculptures. Who could resist that broad grin and all those pointy teeth? His languishing attitude and gleeful expression here capture his humorous, playful mood. My niece enjoyed practising her best Cheshire-Cat grin with me. This glorious set piece would have been even more impressive had not the vandals who struck the “Fish Delivery” sculpture the night before thought it amusing to ruin this artwork as well. One would like to imagine that they were at least enacting some kind of ironic performance of the text, embodying the Red Queen’s desire to behead everybody. Unfortunately though, it seems unlikely that anyone who finds destruction of art amusing – especially at the expense of all the children and adults who came excitedly to see it the next day, and whose hopes were disappointed – would possess such awareness. Below you can see the sand being rebuilt, ready for the artist to resculpt it. This was my favourite sculpture because of its beautiful illustrative quality, as if the pages of a Victorian illustrated storybook had been brought to life. I loved the composition, balanced between Alice and the Gryphon at the seashore with the path leading behind them to the Mock Turtle in the distance. The level of detail is stunning, and all the characters – particularly Alice – are rendered with a realism that adds depth and emotional pull to the whimsicality of the scene. “‘Hold your tongue!’ said the Queen, turning purple. The sense of tumultuous movement and cascading cards in this sculpture is wonderful. Alice’s pose draws from Tenniel’s illustration, but the new addition at Alice’s feet, where the cards turn into leaves as they settle to the ground is an imaginative and poetic touch. Last but not least, was a sculpture of that most contrariwise of pairings, Tweedledee and Tweedledum. This memorable duo doesn’t actually make its appearance until Through the Looking-Glass, the sequel to Alice in Wonderland, but I suppose they were far too iconic to leave out of an exhibition like this. This sculpture was a beautiful and faithful realisation of the original Tenniel illustration. Overall, the exhibition was a marvellous taste of Carroll’s Wonderland, a fine display of the talent, creativity and imagination of the sculptors involved (and Sand Sculpting Australia more broadly), and a wonderful day out. Did you attend the exhibition? Let me know what you thought of it below! *All quotes are from Lewis Carroll’s Alice in Wonderland and Through the Looking-Glass.